One of the perks of being Head of Technical Services at the Museum of the Moving Image in London was that I got to talk with many interesting members of the public. One day, in the mid 1990s, I met a lady and her teenage son. She greeted me in a broad Scottish accent, introducing me proudly to the youth: “This is James. He’s made a Baird 30-line television, and it worrrks!” James (real name forgotten) was 18 or 19. I congratulated him, but was slightly sceptical, as I knew what was involved in such a project. “Where did you find all the information?” I asked. “Encyclopaedia Britannica,” he replied. My scepticism deepened. “You made a 30-line television receiver from information you’d read in the Encyclopaedia…” The lady broke in. “Well he can’t read, so I read it to him.” Evidently reacting to my bewildered expression, she explained, “He’s dyslexic.” I nodded, and started firing questions at James. “What did you do for a neon lamp?” “Dismantled two electric mains-tester screwdrivers, used the lamps together…..” Sounded plausible. And the big question, “Where was the 30-line signal coming from?” “The local electronics club got some members to build a line-dropper / frame frequency converter for me, so that I could use 625-line signals.” All the right answers. So it was true. He told me what happened if you slowed down the ‘scanning’ disc by pressing on the edge – the image doubled – and of the problems he’d had and how he’d overcome them. I was almost speechless. I lent them my copy of The Television Book (1936) and wished them luck in their future endeavours. “You must be the world’s foremost technical expert on 30-line television construction,” I suggested to James. “Yes,” his mother replied, “and I’m the second.” They returned the book some months later, with a note that James was expecting to start college soon. I bet that kept his mother busy for a few years. Their fellow countryman John Logie Baird would have been so proud of them both. Television. A Monthly Magazine. Vol. 1, No.1, 1928. The World’s First Television Journal. The Official Organ of the Television Society. Editor: A. Dinsdale. (London, The Television Press), 1928. 8vo. Original illustrated coloured paper cover depicting a distinguished couple watching the opera being received on their television set, with the actual opera shown in the background. Profusely illustrated throughout. 52 pages + one loose leaf: “Supplement to Television, No. 1 – March, 1928” (comprising the article “Seeing Across the Atlantic!”). “Of all scientific subjects, perhaps the one which is creating the most interest in the public mind at the present time is television. It is, however a subject upon which almost no literature or authentic information has been available, either to the interested amateur or to the scientist. It is the object of this, the first journal of its kind in the world, to fill this want, and to supply an organ the sole object of which will be to keep interested members of the public supplied with up-to-date and authentic information upon this new branch of science, which bids fair in time to rival wireless broadcasting in importance and popularity.” (from the Editorial by Dinsdale). Television, Vol. 1, No.1, March, 1928, London, 1928. 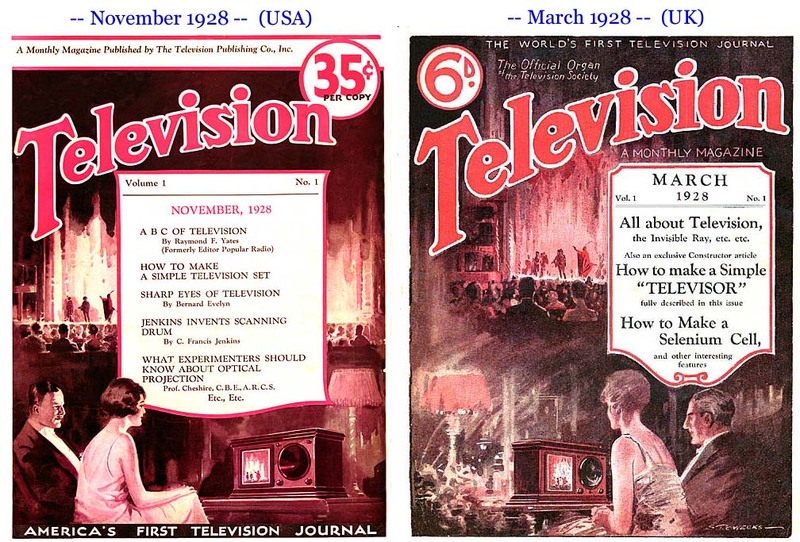 The first issue of the world’s first television journal, the official organ of the Television Society. 52 pages; illustrated throughout (including a full page by W. Heath Robinson); original pictorial wrappers. Includes the rare single-sheet supplement with the article “Seeing Across the Atlantic!” Articles include ‘Noctovision: Seeing in Total Darkness by Television,’ by Roland F. Tiltman; ‘Light-Sensitive Cells,’ by K. M. Dowberg; ‘Television on the Continent,’ by M. Dumont; ‘How to Make a Simple Televisor,’ by the technical staff; ‘Commercial Television: When May We Expect it?’ by the editor, Dinsdale; and, ‘Glimpses into the Future: Television in Warfare,’ by R. Heath Bradley, and others. Perhaps no other published item in the history of television more successfully evokes the very beginnings of the medium’s introduction to the public. Condition: Very good. Some lower corners have a crease in the margin, and dusty in that area. Pages are slightly tanned, but firm and supple. Staples just starting to show rust. Now in an acid-free paper wallet inside cloth-covered boards, ready for your bookshelf. Scarce, and almost impossible to find in this condition. There’s a copy on ABE as I write, at £1,000 plus, and another at just £360. The example here is in better condition than the last mentioned. Le Petit Inventeur. New Series nos. 1-25. Editions Albin Michel, Paris. 400 pages, Colour covers, b/w interiors. Hardback, bound in paper-covered boards, with coloured illustration on front. Size: 200 x 282 mm. I would once have categorised the picture on the cover of this book as ‘Early television’, or ‘Videophone’, but of course it would now be best described as webcam skyping, or whatever the current phrase is for keeping up with family and friends online, both visually and sonically. This French magazine started in the early 20s, and this is a re-start from c.1930. Odd little pieces, with many b/w drawings, about all kinds of technological realities and promised future science-fiction gizmos that the boffins were just about to make real. In truth, the covers are the best part – and there are 25 of them, with most reproduced below. Great fun, and useful reference material for anyone writing about ‘the history of the future’. These magazines are not hard to find in their country of origin, but the bound volumes make collecting them much easier, and are rarely found outside of France. Condition: Interior very good, with usual tanning of the pages. Some foxing to the covers (and minor marks to top margin), and a new webbing repair to the top of the spine. The old pasted-down endpapers are cracking at the spine joint, and there are a couple of small old paper repairs there, but the binding is still holding well so I’ve left those minor faults. Video discs. an invention of TELDEC TELEFUNKEN-DECCA SCHALLPLATTEN-GESELLSCHAFT M.B.H. In 1970 – or was it 1971? I was technician for a conference about Video Discs, held at the National Film Theatre. The possibilities of this new medium, not yet commercially available, were promoted – short extracts from videos of surgical operations, so that surgeons could easily have repeat viewings in their office or at home, and other groundbreaking possibilities. To set the scene, it should be remembered that this was many years before VHS and Betamax, and before the introduction of the Philips VideoCassette. The images were recorded on an 8-inch-diameter (200 mm) flexible foil disc which spun at 1,500 rpm on a cushion of air, and reproduced by means of a pickup with a diamond stylus. Running time: 5 minutes (12-inch disc: 7.5 minutes). I think it was intended to have a demo at the talk, but the gear didn’t materialize – though I do remember seeing a sample flexi-disc. Launched a while later as TeD (Television Electronic Disc), there was limited commercial application. The technology moved on. The year that TeD was launched I wrote a science fiction short story, Razzle Dazzle (Science Fiction Monthly, August 1975) alluding to the Philips LaserDisc, then in development. Twenty years later, in the museum building next door to the NFT, I found myself Technical Manager responsible for perhaps the largest (anywhere) installation of Philips LaserDiscs – 72 players that whirred away all day, six or seven days a week. I picked up a leaflet at that 1970 conference, thinking “This might be of interest in the future.” Well, the future has come and gone, with the later development of LaserDiscs now a distant memory, and DVD and BluRay fading away as downloads and modern storage methods take over. So here it is, a leaflet from the deep past of visual media. Well, my deep past, anyway. For all Recording Tape Users. Published by Badische Anilin-& Soda-Fabrik AG Ludwigshafen am Rhein and distributed by BASF Chemicals Limited, 5a Gillespie Road, London, N.5. 20 pages including cover. Size: 146 x 146mm. The main interest is a short piece entitled Tape Recording of Vision and Sound, which occupies less than 4 pages. Telcan was the first attempt at marketing a domestic “TV recorder” in the UK. For those of us not backroom boffins in tv studios, the idea of recording moving images onto magnetic tape seemed like some kind of magic. Yet this is what we were promised. A friend told me years later that he’d been to a demonstration at a London hotel. The quarter-inch tape was moving at 120 inches per second! The system worked, it was marketed briefly, but soon died. The young people on the cover are perhaps recording a play – in between cigarette puffs. No doubt they would also drag out the Grundig occasionally to record messages for friends; as explained herein, swapping audio tapes by post was a popular hobby in those days. I was doing it myself a few years later. Social media of the early 1960s. In 1973 or ‘74, I was a technical assistant at a late-night presentation at London’s New Victoria Theatre. Usually employed to project films or work the ‘limes’ (follow-spot) for the London Festival Ballet season, my role in this particular show was minimal – but it was certainly an extraordinary experience. A Mohammed Ali boxing match was being transmitted live from the USA, to an Eidophor video projector – a huge, ugly beast that required four men to carry it, strung onto scaffolding poles. The machine was set up in the back stalls, roped off within touching distance of the audience, and the signal came through from the Post Office Tower (as it was then) – to an outside van? – and by cable to the projector. At least that’s how I remember it as I glimpsed the preparations while scurrying about with polystyrene cups of coffee for those who were actually doing the work. After warming up for an hour the projector gave a ‘raster’ on the screen, and then an amazingly clear black-and-white picture of the ring appeared. Our audience of perhaps 2,000 fight fans jostled into their seats, and the pugilistic punishment began. The technology was all working well, but there was no Plan B. The video technician standing next to the machine said to me as the fight hotted up and our own beered-up crowd became at least as excited as the natives, “You realize, if the projector lamp goes pop or the signal’s lost, we won’t get out of here alive?” I have no interest in boxing and I remember nothing of the bout – perhaps frozen in sheer terror at the potential result of a technical failure – but from the dates it must have been either Joe Bugner (February 14, 1973) or Bob Foster (November 21, 1972) who lost to Ali that night. I was reminded of that episode when I found this item, twenty years later. Original cartoon artwork signed by James Francis Sullivan (1852-1936) , in period mount. The idea of television and other forms of seeing-at-a-distance flourished in the late 19th century. In 1889 Thomas Edison encouraged reporters to believe that he had already achieved some experimental results with ‘… an invention which will enable a man in Wall-street not only to telephone to a friend near Central Park, say, but to actually see that friend while speaking to him.’1 This invention failed to appear but the popular press and satirists soon latched onto the idea. In July 1889 two relevant cartoons appeared in the satirical magazine Fun, a rival to Punch. In ‘Professor Goaheadison’s Latest’ (3 July 1889) a gentleman wishes to consult his doctor, Sir Settemup Pilliboy in Harley Street. Not happy about the prospect of a journey to London, he is told of Professor Goaheadison’s Far-Sight Machine: “by means of which a person in Nyork can actually see another person in Shicaago, or Borston, or even ‘Frisco’”. The writer uses the concept to make political comment about contemporary concerns. The text has an accompanying drawing of a videophone / webcam, sketched by James Sullivan, best-known for his cartoons featuring the working man. The artist imagines a form of trans-Atlantic cable virtual-reality boxing. No need for one of the fighters to cross to another continent – he could fight from home. A Far-Touch machine is seen as a logical follow-up to Edison’s proposed Far-Sight machine; the latter we are told is being used by the boxers to keep sight of each other as they trade punches. ‘EH? Goaheadison’s Far-Sight Machine? Bless your soul; that’s quite an antiquity now. Quite eclipsed by the Far-Touch machine! Haven’t read the account of that mill between Dan Dotter of Doncaster and the McFlattener, the Boston Bumper? Oh, yes – all carried out by cable; one end of it at Doncaster, and the other at Boston. Dan faced the machine at the Doncaster end in good form at 11.32. Some very pretty play. Dan dodged a cleverly-tried jaw-compresser from Mac’s right, and got the electric current onto the ropes in the fifth round. Then the machine planted several on Dan’s ribs; & Dan came up groggy for the 17th round; but supplied the cable with a neat lifter under the ritht ear at 12.13 1/4. On the call for the 24th round Mac forgot to come up; & Dan got the belt. At the end, a passing gentleman is sent sprawling by the full thrust of a stray punch. During the affair an amusing incident occurred. to pass in front of the transmitter. Curable in six weeks, with reserve. The published version had typeset text. The version offered here is the original cartoon artwork hand drawn in ink, with manuscript ink captions on the card mount. The cartoon is in three pieces, mounted at the back with brown paper tape, into the three beveled apertures. Sullivan’s signature is meticulously lettered on the lower piece. The card mount includes another version of Sullivan’s signature. I believe that the manuscript captions and signature on the mount were also most likely both written by Sullivan at about the time of the creation of this piece, but of course it’s impossible to be certain. In very good condition. Mild foxing and yellowing to the original cartoon. Tanning to the edges of the mount. Mount size: 372 x 527mm. A digital printout of the published version will be provided with the original. With thanks to Dr. Nicholas Hiley for information about Sullivan. 1. Levant Herald, 1 September 1889. 2. This artwork, ‘Goaheadison’s Real Latest’, has been reproduced in two modern publications: the academic journal Early Popular Visual Culture, Vol. 9, Issue 1, 2011; and: A History of Early Television, Volume 1 (Routledge 2004), edited by Stephen Herbert. ‘Goaheadison’s Real Latest’, Fun, 17 July 1889, p. 24. Scroll down for more pictures and further items.